Dr. Iyad Abumoghli has more than 34 years of experience with international organizations, the private sector, and scientific institution. Dr. Abumoghli’s expertise focus on strategic planning, sustainable development, water resources management, and knowledge and innovation. Currently, Dr. Abumoghli is the Lead Principal Advisor on Engaging with Faith-Based Organizations at UN Environment. 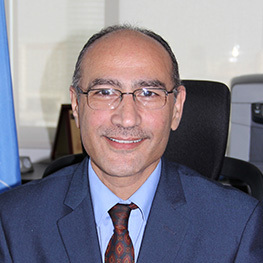 Previously Dr. Abumoghli held several leading positions including the Regional Director and Representative of UN Environment in West Asia 2012-2017, Director of Knowledge and Innovation at UNDP’s Regional Office in Cairo 2009-2012, Senior Environment Advisor at UNDP’s Sub-Regional Resource Facility in Beirut 2006-2009, Global Practice Manager for the Energy and Environment Group in New York 2003-2006, Assistant Resident Representative of UNDP in Jordan 1997-2003. Dr. Abumoghli adopts a holistic multi-sectoral approach to development ensuring cross-thematic integration with internal and external partners. Dr. Abumoghli holds a doctorate degree in Bio-Chemical Engineering from the University of Bath/UK, an outstanding graduate of the Virtual Development Academy – Johns University, and a BA in Chemical Engineering from University of Jordan.